It's been a long time - almost 1,000 days to be exact - since the last worthwhile Mac Pro update. However, that could change this month...or the next...or the next. 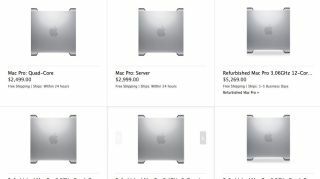 It very much depends on Apple's timing, but a new report suggests that a Mac Pro "replacement" is indeed in the offing. According to Mac Daily News, a new member of the Pro family will likely have an April reveal, though warns not to be surprised if the announcement slips into May or June. The site's source couldn't say whether this replacement will be a tower, mini-tower or something else, only that a refresh to the lineup could come soon. This tipster is said to have been right about Apple product announcements in the past, but Daily News still categorized the latest as a rumor. Besides stalling on a significant update, Apple also has a sales problem in Europe. Not that the workstation comp isn't selling well - it isn't selling at all since a ban went into effect earlier this year. Regulatory requirements dealing with unprotected fan blades put the ax on Pro sales, so Apple has more than enough incentive to come out with a new model to meet European demand. What's more, the Cupertino company also reportedly told resellers on the continent it would have a new model and not simply a minor update ready to go by spring 2013. Apple has until June 21 to make good on that promise.